All artwork and designs available for download are the exclusive copyrighted works of Ladies Offroad Network. All Rights Reserved. Any unlawful alteration, reproduction, or redistribution of artwork featured on this site without prior express written authorization of the copyright owner is strictly prohibited. Please contact Winning@BowerMedia.com or call 480-490-2019 for usage rights. 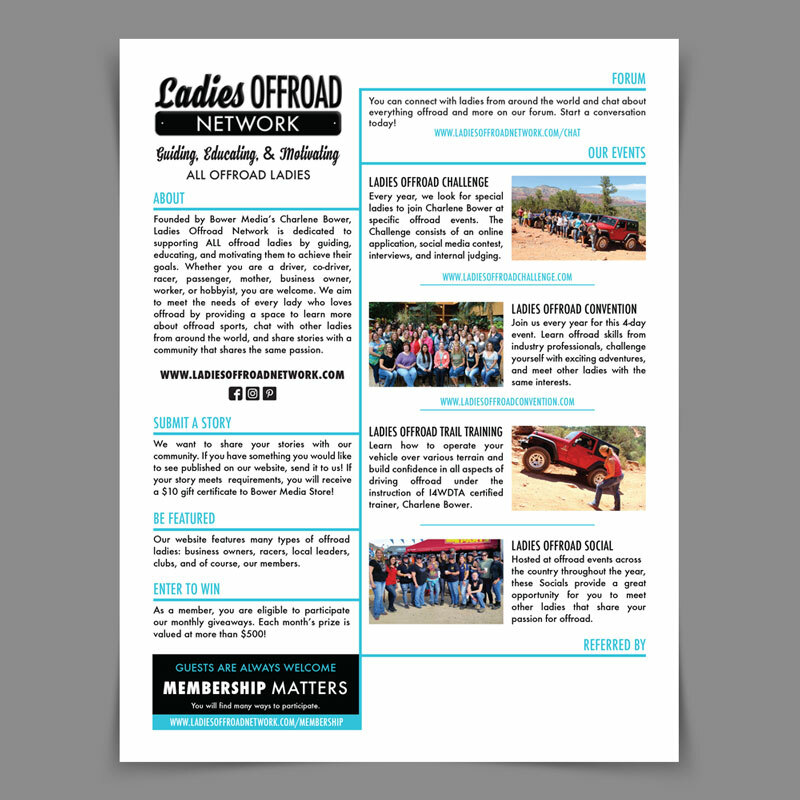 Print this flyer at home, and share Ladies Offroad Network with the people in your community. Don't forget to fill in your name at the bottom to get store credit when your referrals become new members! Dimensions (W x H): 8.5" x 11"
Download the artwork for a referral card so that you can share Ladies Offroad Network with everyone you meet. Fill in your name to get store credit when your referrals become new members! 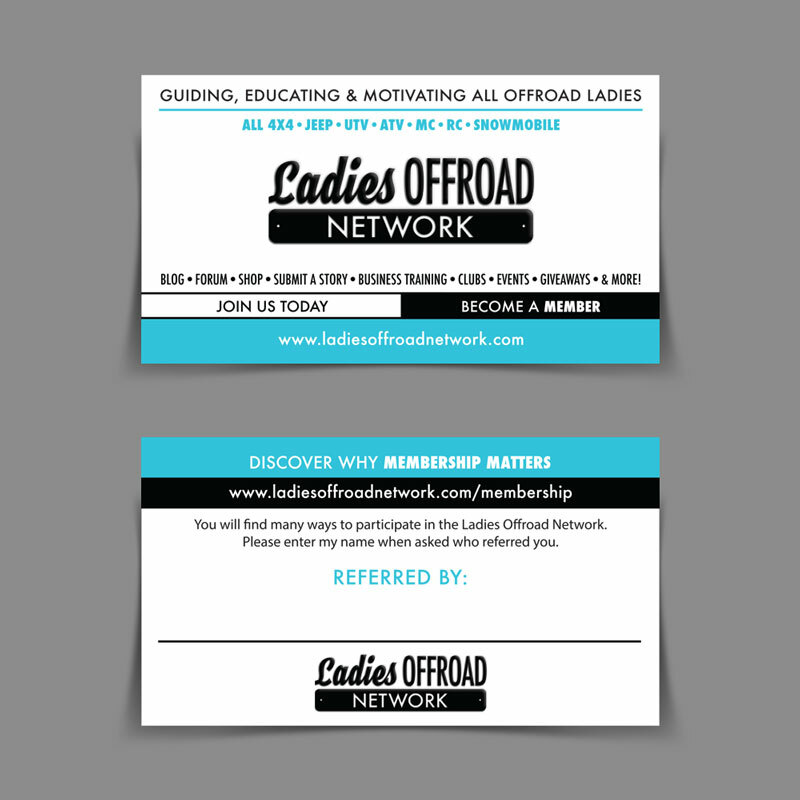 Dimensions (W x H): 3.5" x 2"
Download the logo so that you can share Ladies Offroad Network. Please ask for proper usage rights for logo before adding to print materials or creating products. Dimensions (W x H): 11" x 3"
Dimensions (W x H): 18" x 18"